A Childhood. Sandra Barnard and Myrna Shoa record their stories. Our mother, Ina Hendry, was born in Clydebank, Scotland in 1904,the second youngest of five children. She was the daughter of James and Margaret Hendry (nee Stuart).Her sisters and brothers in order of birth were, Jean, the oldest, who arrived at the very end of the 19th century, then Robert, the second born. He emigrated to the United States as a young man, tried to make a career in show business and then began working in the automotive industry. He settled in Chicago where he married Jeanie. Betty was the third child. She moved to England and married Bert Fay a chef in a London hotel. They adopted Bert’s natural daughter, Cathy. They had no children of their own. The youngest was James. He married Nellie, considered by his family to be socially beneath him. Nellie was a Catholic. They had a large family and lived on a council estate near Loch Lomond. James worked as a master butcher. He died of lung cancer in the late 1950s. Myer Horowitch started his own business, buying waste wool, cotton and scrap metal, sorting it and selling it to manufactures, where it was recycled and made into new products. Joseph left school at 14 and went to work for his father. Joseph had contracted Rheumatic fever when a small child. This damaged his heart, which caused his premature death when he was in his fifties. Ina and Joseph married in 1922. Ina was not welcomed by Joseph’s family. 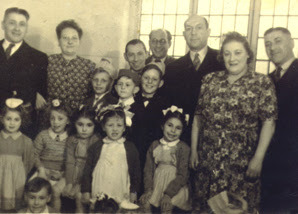 Mixed marriages were considered by both the Jewish and Christian communities as something to be avoided. However, over a period of time, relations improved and Ina converted to orthodox Judaism. She married Joseph in the Synagogue on July 26 1931. She became a Jewish woman, learnt the rituals and festivals. (By the time we were born she had in fact got a Ketubah, a Jewish marriage contract, therefore confirming that we were Jewish). They wanted children, but it seemed it was not to be. They considered adoption and then after being married for 20 years the miracle happened. Ina was pregnant. 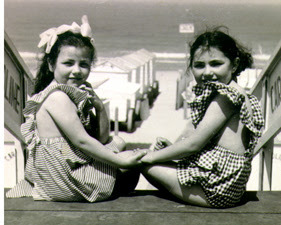 Myrna was born in September 1943 and 13 months later a second daughter Sandra was born. Ina named Myrna after Myrna Loy the American film star who was famous for her long beautiful legs. Ina had become very fat, 16 stone in weight and she didn't even realise that she was pregnant, putting the pains down to heartburn! Maybe Joseph had impotency problems and that is why she never conceived earlier, or maybe he just didn't fancy her as her shape had enlarged considerably over the years. Of course we believed in Father Christmas; leaving a pillowcase out on Christmas Eve for him to fill. Then we discovered the truth. Dad was Father Christmas and not a man with a red hat and coat on with a beard, but Dad, swarthy and handsome even though he was old. I can remember when sweets were rationed, rice was only used for making rice pudding, olive oil was bought at Boots the Chemist in little bottles for removing ear wax, spices were limited to cinnamon, nutmeg, pepper and cloves, all vegetables were boiled to death, crisps only came in one flavour, garlic was the work of the devil and everything seemed so bland. Being brought up in a Jewish household meant that some of the food we ate was more interesting than the usual British diet. Chicken then was a luxury food yet we ate on a regular basis, either made into wonderful chicken soup with mandels or alkies or roasted for Sunday lunch. Mum made the best chopped and fried fish. She always swore that a mix of hake and haddock gave the best and sweetest flavour. This would be chopped with onion, loads of eggs, matzo meal and seasoning then formed into generous patties and fried in oil until deep golden brown. I enjoyed them either hot or cold, served with the beetroot and horseradish relish called chrane. Myrna didn’t like that sauce! I still hanker after the black bread of my childhood. It doesn’t seem to exist anymore, or at least I can’t find it. This was a crusty sourdough bread made with rye flour and caraway. It was wonderful, as were, and still are, proper Jewish bagels, hard and chewy, nothing like the soft US version sold in most supermarkets today. We would enjoy salt beef, pickled brisket, worsit and the deep red savaloys served with potato latkes and sweet and sour cucumbers. This was the kosher food of the Ashkenazi Jews of Eastern Europe, hearty, full flavoured and very different from the cuisine of the Sephardi community. We would go to Lapidus's, a local Jewish delicatessan and take away, have a salt beef sandwich at the same time as eyeing up the young men also buying food there. 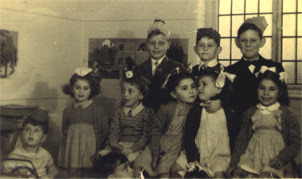 When we were about two years old and three years old respectively our mother found it far too hard coping with her small daughters and arranged for us to attend a private Jewish school, Cassel – Fox, about quarter of a mile from our home. On their first day there Sandra can remember crying when mummy walked away from them, but she was lucky having her big sister taking care of her. Myrna had to be strong and brave for her little sister. We would go to school first thing in the morning, have lunch there, then be collected by our mum in the afternoon and walk home. The teachers were very strict about not wasting food and would be angry with any child who left food on his plate. We learned tricks such as wrapping the food we didn’t like in our handkerchief and hiding it in our pocket. Sandra remembers that she really liked the lochen pudding and never had a problem in eating it all up. When a child had been tearful, he or she would be sent out of the classroom and not allowed back until the crying had stopped. Sandra can remember being filled with righteous indignation when on one occasion the teacher came out of the classroom to see if she had stopped crying, which she had, but wouldn’t let her come back because her breathing wasn’t yet under control after expending all that emotion. The children were not allowed to use their fingers as an aid to counting. Sandra got round this prohibition by leaning on her elbow and counting with her fingers on the side of her head. When challenged by her teacher as to what she was doing she replied that she was thinking. Myrna remembers hating the food. It was after the second world war and food was still rationed, choice was limited and you had to take what was available. But, as a child Myrna didn't know, care or understand the situation: she just hated the food. 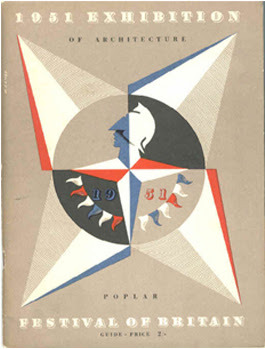 Joseph Tishler a fellow pupil aged five or less kissed Myrna up and down her arms and in his strong passion pursued her relentlessly....to no avail. Our mother enjoyed a drink and a smoke whilst watching TV. She would have a glass of whiskey and orange. When she and dad came back from their dinner dances she sometimes had a problem keeping her balance, drunk almost falling down when getting out the taxi. This didn’t become a major problem until in 1954 she had a really bad accident falling down a long flight of steep stone steps outside Joan Lakes house. She claimed she felt all right and drove herself home in her Ford Console. Later in the day she felt very ill and called the doctor who diagnosed concussion and told her to rest. He missed the point that she and she was in fact bleeding into her brain and a blood clot was forming. This necessitated an emergency operation to remove the blood clot or she could have died. Roughly the same time her youngest brother James was diagnosed with terminal lung cancer. She was flying backwards and forewards to Scotland to see him. She felt she had to go and visit him. She seemed to take the news really hard, yet we didn’t know she cared that much as we had never met him or his family. He died within a year of the diagnosis. She started drinking secretly and heavily and became a danger to herself and others. She was falling around all over the place. Her voice was often slurred. She made pointless and senseless demands and became extremely difficult to live with. She hid her alcohol, brandy anywhere in the house. Many times we came home from school she was drunk, her voice was slurred and the gas poker was on but not lit. She kept saying that she wanted to die. We used to call Dad when we felt we couldn’t cope. He would come home and help us manage her. 'Myrna, Myrna,Sandra, Come here,' Mum would call us. We would find her naked, drunk, and horrible. She would place her hands on the shoulders of one of us, so that we could take her to the toilet and then back to her bed. Because she was drunk she would sway and could easily have toppled over. 'Myrna, Myrna Sandra,' she would call. Sometimes we would find her on the floor, drunk and unable to get herself up. We had to haul her up while she continued ranting to us about how bad we were or that we didn't care for her. We missed a lot of secondary schooling thorough having to be at home to keep an eye on her. We didn’t want anyone to know outside the house. It was difficult for girls, pre teens to cope with. That fall and the subsequent drinking exaggerated who she was already, Myrna thinks. We couldn’t bring friends back to our house after school in case we found our mum drunk. The shame and embarrassment would have been too much to bear. We had to take on the responsibility of the cooking, cleaning and looking after the house. We were only eleven and twelve at the time. Also, she never liked our friends. She would verbally pull them to pieces and tried to stop the friendships in this way. Mum’s problems continued to dominate our lives through all our teens and into our twenties. Her emotional manipulative manner continued to have a power over us for years. Even after she stopped drinking, she didn't stop being demanding and manipulative. Even before she had a drink problem, she made us curl up in embarrassment. On social occasions she was seen by many as good fun, ‘the life and soul of the party’. She loved to be the centre of attention and would dance the highland fling. She was a huge woman and to us she looked ridiculous and we felt that people were, in fact, laughing at her and not with her. The more extrovert she became the more introvert we became. After all she was old enough to be our granny and maybe that was why we felt so self-conscious? Secrets were a part of our way of life. Secrets that she hadn’t been born Jewish, (By the time we were born she had in fact got a Ketubah, a Jewish marriage contract, therefore confirming that we were Jewish), and secrets that we ate bacon behind closed curtain surrounded by Jewish families. Secrecy about her drinking and suicidal tendencies. Dr Levy our family doctor gave her far too many prescribed drugs barbiturates which she became addicted to for many years. No-one was there to support us two young girls. Dr Levy and Dad would say that we had to care for our mum, our duty was to be there for her. It affected our schooling, our social life, our confidence: it put a huge strain on us. We were part of a cover up to keep up pretences about what really went on behind closed doors. However we learnt to be ultra sensitive to drunkenness, emotional blackmail and manipulation. However, we both have ended up creative, warm women. We didn't let what happened in our childhood turn us into 'victims'. It had an effect on the people we eventually became, but it didn't dictate our lives. We both realised that it is easy to stop yourself from doing things because you convince yourself that you have to sort out your childhood problems first. It is easy to remain stuck in the child role, but we are not those children anymore. We were still at primary school in 1953. It was near to the end of October. Children were collecting firewood for their bonfire celebrations. 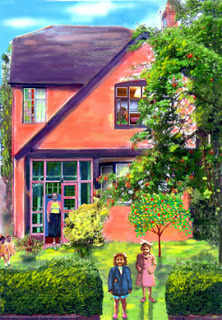 The local children called at Aunty Rosie and Uncle Morris’s house in Brunswick Street. Aunty Rosie gave them an old broken down armchair she wanted rid of. They hauled it away and took it back to their bonfire site. As they were breaking it up, to their amazement inside the wadding, they found about a £1000 in old and out of date bank notes. This would be the equivalent today of perhaps £40- £50,000 in terms of what it could buy. The excited children took some of the cash to Heighways, a local toyshop in Cheetham Hill Road, to spend it. Having made their selections they handed the money to the shop assistant who in turn called the police. The money was traced back to our family and returned to us. Our Granddad, Myer, never fully trusted in banks and liked to have cash hidden around his house in tins, cupboards and under mattresses. 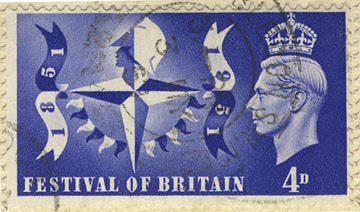 He had come from Dvinsk in Latvia to England as a penniless refugee and hadn’t adapted to the new country. He was illiterate in his own language Yiddish as well as English, so he had to sign his cheques with a cross. 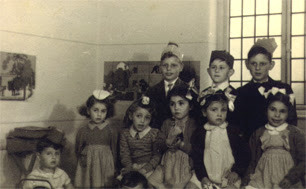 Myer a religious Jewish man wore a yamulka and prayed, (yet our mum told Myrna that his fly was often left undone).One Sabbath evening during the war he just walked out of the house in Brunswick Street. As it was Sabbath he wasn’t carrying any money in his pockets and was never seen again. Mum and dad checked with the police, hospitals and the morgue to no avail. The most likely explanation was that he was killed during an air raid and maybe blown to bits. Of course he never made a will and for over twenty years the family solicitor was trying to sort out Myer’s estate.‘Next year god willing Joseph, it will be sorted.’ Myer treated our Dad badly he obviously didn’t love him as he wished our dad had died from the fever instead of his beloved youngest son Simon. He asked god why he hadn’t taken Joseph instead of Simon. After dad left school at the age of fourteen he was employed by his father but paid poorly. Even after he was married he was still on a low wage and he would often walk home from work to save his bus fare so that he could take Mum to the cinema. Myer would put a piece of coal on the fire, decide it was warm enough without it and take it off again rather than let it burn away. Uncle Morris. One of Rosie's brother. Joseph our dad was her younger brother. Meyer’s daughter Rosie, a pearl in his eyes wanted to get married and her parents had to make a suitable match. But a match was proving difficult to make for unfortunately she wasn’t an attractive girl. In fact she looked older than her years, with a raw peasant face and strapping figure and although she had qualities, conversation wasn’t one of them. She had the habit of repeating the trivial bits of gossip that fascinated her but left others yawning. Every year at the Jewish Passover feast she would ask the same question about which Matzo we had this year. When we were living at our house in Stanley Road and aged about three and four years our mother decided that as our birthdays were only just a month apart she would arrange a joint birthday party for us and as a special treat would hire a Punch and Judy man to entertain us and our guests. The great advantage of our house was that it had been built over three floors and the top floor, which was a huge room, was our wonderful playroom. It was the place where our imagination could run beyond any limitations. It was our space and it was in the playroom that the puppet theatre had been set up. After the usual birthday tea of egg, tinned salmon, cheese and tomato sandwiches, chocolate biscuits, jelly, and birthday cake we all trooped upstairs for the live entertainment. At first everyone was having a great time until the crocodile made his first appearance. This was all too much for Sandra who immediately burst into tears. Luckily for her, Myrna was at hand to comfort and protect her. When I was about three years old I needed to have my tonsils and adenoids removed. It was arranged that I would go into hospital and have the operation and these are my memories and interpretations of what was happening to me. I can recall the room where I stayed. It was a side-room, which I shared with one other patient. He was an adult male and I think I was told not to bother him, as he wasn’t very well. I can remember being really offended by being put in a cot with barred sides. At home, I slept in a proper bed. Only babies slept in cots. I soon recovered from the operation and was allowed to go home. I was taken down to the hospital kitchen to wait for my mum to come and collect me. I watched the cooks prepare the food, but I wasn’t allowed to sit and watch, as the chair by the table belonged to the hospital cat. When I got home there were lots of exciting toys waiting for me, to cheer me up. The best was a wooden Noah’s ark with cut –out wooden animals in pairs. I loved that toy. Our Uncle Robert and Aunty Jeannie from Chicago were coming over for a visit as well. It was the first time Robert had been back to the U.K. since his emigration nearly thirty years earlier. Our parents went to London to meet them from their flight. They stayed overnight leaving their daughters in the care of Margaret the maid and Edie the charlady, who had worked for the family for years before the girls had been born. They all came back to Manchester the next day. While our parents were in London, Sandra had suffered an accident at school and hurt her arm. She was taken for an x-ray at the hospital the next day where it was discovered that she had chipped a bone. So by the time her parents and their guests arrived in Manchester her arm was in plaster. Uncle Robert had thick white hair and seemed very old, Aunty Jeannie was nice. She was a teacher in America and was keen to visit our primary school in Cheetham Hill and this was arranged. We all enjoyed having our American visitors to stay. They seemed both familiar and exotic at the same time. It was decided that we would all spend some time in London. 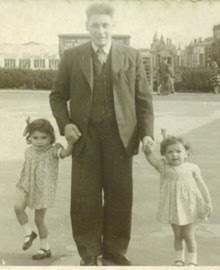 Robert wanted to visit his two sisters Jean and Betty who lived there. 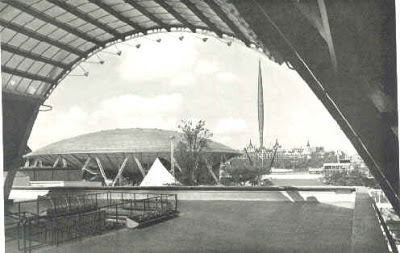 Robert and Jeannie would go on to Scotland to see his youngest brother James while we would see the sights in London, visit ‘ The Festival of Britain’ and go to Battersea Fun Fair. This was Myrna and Sandra’s first visit to London.It was very exciting. We stayed in the Cumberland Hotel at Marble Arch, travelled by tube for the first time, had our first meal in a Chinese restaurant as recommended by our Uncle Billy the chef. We visited Madame Taussauds waxworks museum, Trafalgar Square, where we fed the pigeons, the Houses of Parliament and Westminster Abbey, which in those days were both pitch-black due to pollution from coal fires. We spent a day at the festival show ground.The only memories Sandra has are of the ‘Skylon’, a slender leaf shaped aluminium sculpture on a huge scale held upright by tensioned metal wires and a sculpture of a family group in bronze by Henry Moore. The following evening we all went to spend an evening at Battersea Fun Fair. This for the girls was one of the highlights of the whole visit. It was crowded, noisy and exciting. There were dodgems, roundabouts, coconut shies, and shooting galleries. Everything you could possibly imagine at a fun fair and more. Sandra was in the care of Margaret the live in maid. They had been watching someone unsuccessfully trying to throw hoops over prizes. 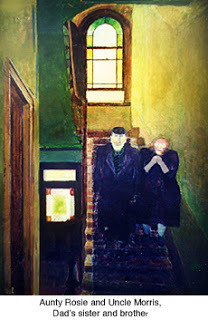 When Sandra was ready to go she turned round and to her shock there was no sight of Margaret. In fact there was no members of her family about at all. She panicked, started to run, first one way and then the other. Nothing! She began to cry. Luckily she was quickly found by a special warden whose job was to rescue lost children. She was taken to a huge hangar-like building where other lost souls were waiting to be claimed by their families. It didn’t take all that long for Sandra to be reunited with her family but it did take a long time for her to get over the fear of being lost in a strange place. It was a Friday evening, mid-July 1961. We were waiting for our father to come home from work. Our little dog, Tamba, would watch out for him standing on a chair in the dining room bay window, with his front paws on the windowsill. He would start to bark and wag his tail in excitement as soon as he spotted him. Dad arrived home at his usual time. He looked tired. Dinner was nearly ready. We all sat down and ate our Shabbats dinner together. After the meal had ended and the dishes had been cleared away, we settled in the living room to watch some television. At some point our mother glanced at our father and noticed that he was very pale and that his lips seemed blue. He hadn’t said a word, but she knew that he was having a heart attack. She phoned a near neighbour who was a doctor and he was at our house within minutes. We girls were sent out of the room while the doctor attended to our father. We had no idea what was going on. After a while the doctor and our mother came out of the living room. The doctor was saying something like ‘this time you have been very lucky’. Our dad had survived his heart attack. We were so relieved and grateful. The doctor said that our father needed a good nights rest and that he would arrange for him to be admitted into hospital the next day, then he left. Our mum had a serious talk with us both. She said that life would be very different for us all now. Dad would probably have to give up work and retire. We didn’t mind, we just wanted and really needed our kind and funny dad to be well. We all went to bed, mum was able to relax and finally fall asleep when she heard our dad snoring gently. In fact, it was the silence that alarmed her when she woke some time later and checked on him. She came running into our bedroom, crying and wailing ‘your dad’s dead. Come at once.’ Myrna was the first to leap from her bed and followed our mum back into the other room. ‘He can’t be dead.’ Myrna was saying. She sat on the side of the bed and touched his face She knew immediately that he was gone. He was so cold, felt like a cold, dead chicken. Sandra didn’t enter the room. She couldn’t bear to see her father like that. We were all shocked. There were things to attend to. People to inform, rituals to perform, curtains drawn, mirrors covered and this got us through the next few hours. A funeral had to be arranged. If possible, a Jew is buried on the day he dies. As soon as the death certificate was signed the undertakers arrived and our father’s body was removed. A week of mourning takes place in the home of the deceased. The men gather in one room and say the prayers and the women sit in another room and comfort the wife. Our mother was in a state of profound grief and everyone told us girls how we had to support her and be strong for her, but we were grieving too, only there didn’t seem to be any space or time for us to talk through our feelings and pain, as we had to give all that focus to our mother. No one asked us how we felt, comforted us, or noticed us. Mum’s grief was all-important. It was more than fortunate, that as sisters, we had each other. Up to today we still have each other. ‘Did you have a good summer holiday?’ This was the first question college friends’ asked Myrna after she returned to her art course at Manchester College of Art and Design for her final year of the Art Foundation course. She was only 17 and Sandra 16 years old. Our Dad had died in July. She couldn’t tell them that. They might have felt awkward and she would have felt too emotional Our Dad was only 58 when he died without warning. Dad was sweet, had silly jokes and was our protector against Mum. Myrna felt that her perception of life had changed forever. The temporariness of everything took away her innocence. Months after Dad's death, our little dog, Tamba would still watch out for him, standing on a chair in the dining room bay window, with his front paws on the windowsill. He would start to bark and wag his tail in excitement and tremble with the anticipation of seeing him again. As a child, at bedtime, my active imagination was often too powerful for me to sleep. I was frightened of fluttering moths, scared of the dark, the passing cars lights, strange sounds and flickering shadows terrified me. I found it hard to close my eyes and go to sleep and dream. Sandra was there to support me. We would hold hands across our two, side by side, single beds, and when my fearful imagination got the better of me, I would get into her bed and sleep cuddled up to her. 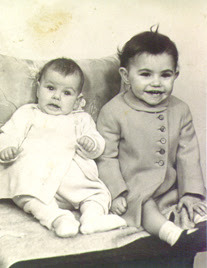 My wonderful sister Sandra is still there to support me when I feel stuck in emotional and practical situations. She is brilliant at helping me sort out calculations regarding finance or number. I have a powerful visual brain and I just don’t get the concept when it comes to number. She has helped me tremendously over the last few years. There are a few really important people in my life and I include among them some dear friends. I can’t even begin to quantify or qualify the love I have for my two sons, it is beyond measure. However I do want to try and describe the love and appreciation I feel for my sister Myrna. Whenever there is bad news or good news to share, Myrna is the first person I need to talk to. When my marriage was breaking down, I spent hours and hours pouring out all the emotion and pain to her. She would listen without complaint as I went through this cathartic form of therapy. In January 2006 I discovered that I had advanced cancer, with secondary tumours in the lung and liver. Myrna was at the hospital and stayed to support me within hours of my being told. Myrna is always the one to encourage me in trying something new. She has helped me in learning computer skills, in teaching adults to improve their literacy and numeracy skills and she has, most importantly, encouraged me to be creative in all parts of my life, to study and make art just for the pleasure of it. 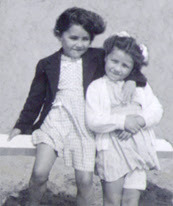 When I look at the very old photographs of Myrna and me as little children, maybe four and three years old, it seems that Myrna is always either holding my hand or has her arm around me in a protective way. This is something she still does for me now and it makes me feel loved and cherished. Sandra died on November 18th 2007. Myrna, Nahem and Inma, and Sandra's sons, Simon and Daniel put her ashes into the sea at Bawdsey and threw flowers and floating candles. She lived creatively and lovingly until her death. Living and dying entwine. Stories of a childhood for our families to read, to answer questions about their backgrounds, history and connection to the other cultures they have come from. 'We wish that we had found out more about our stories from Dvinsk'. Always find out what you can from relatives and friends about your history, your family stories, and write down or record them on film. All our stories are part of the patchwork quilt that makes up life. You can't change the past but with a clearer picture of it you can walk forwards into the future instead of walking backwards into the future.